Wells in Insight have multiple components (e.g. 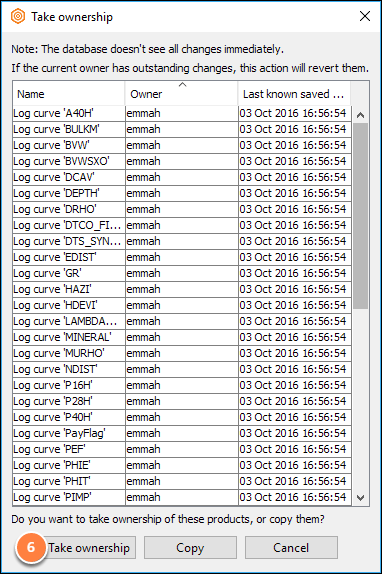 curve sets, marker sets, time-depth pairs, etc.). Each of these components, and the well itself, can have a separate owner. Only the component owner is allowed to make changes to a component. 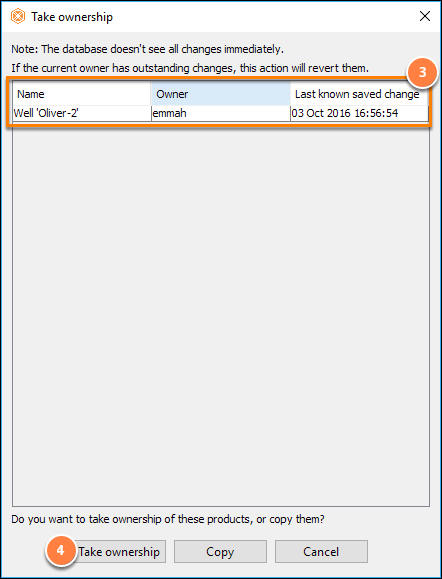 This helps prevent accidental modifications of the data. When taking ownership of a well, consider whether you want to make changes to the top level well (to adjust names, datums, etc. ), or to make changes to the components also. 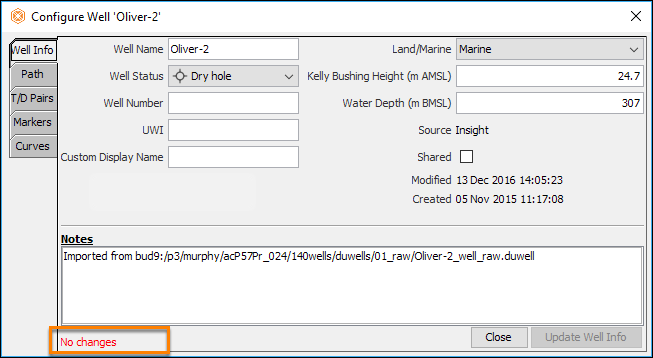 Take ownership of just the top level well, allowing you to change the name, datums and defaults. Take Ownership of "..." and all components. Take ownership of the top level well, and all components associated with the well. Go to the Well tab and right click on the particular well you want to take ownership of. Alternatively, you can also select Configure on the pop-up option panel, or simply double click on the well name, to show the Configure Well window. This window will warn users of the ownership status for this well. Click the Take Ownership of "..." button to assume ownership of this particular well. 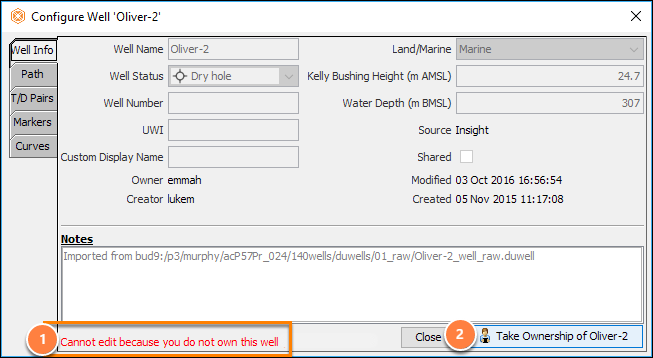 The Take ownership pop-up window will appear showing the status of the well (name, the current owner and the last known save). Click the Take ownership button to take control of this well or click Copy to create another version of this well. 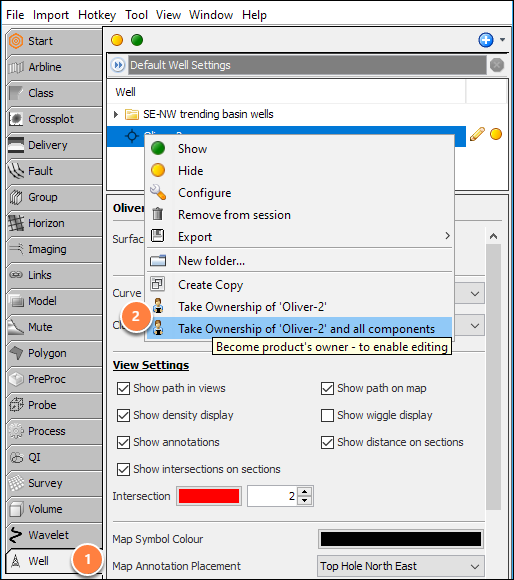 If you select Take Ownership of "..." and all components from the pop-up option panel, a Take ownership window will appear showing all log curves available in that well also. Clicking the Take ownership button will give you the ownership of the well and all corresponding curves, markers, time-depth sets and deviations of the well.